Yesterday home of an artist who painted George Washington. Today, a celebration of George Clymer and all Signers. Across 5th Street from the Independence Hall group of buildings is a quiet pocket park where you can rest your feet and behold a dramatic statue. 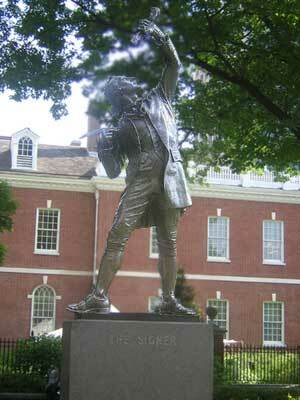 The Signer was inspired by George Clymer, a signer of both the Constitution and the Declaration of Independence, from Pennsylvania. The Signer is looking heavenward, holding a founding document within his grasp. The statue is 9-1/2 feet high, made of bronze, standing on a 6-foot granite base. The statue "commemorates the spirit and deeds of all who devoted their lives to the cause of American freedom." Gilbert Charles Stuart (December 3, 1755 — July 9, 1828) is most famous for his painting "Athenaeum Head," the portrait of George Washington seen on the $1 bill. Stuart was born in Rhode Island and worked both in America and in Europe until moving to Philadelphia in 1793. He moved to the house here in 1795. It was across the street from the seat of the US government, which was in Philadelphia from 1790-1800. Stuart's gift as an artist was rewarded by having many of the leaders of the day sit for hours to be painted. Sir: I am under promise to Mrs. Bingham to sit for you tomorrow at 9 o'clock, and wishing to know if it be convenient to you that I should do so, and it shall be at your house. When I painted him [Washington], he had just had a set of false teeth inserted, which accounts for the constrained expression so noticeable about the mouth and lower part of the face.